Merkel has since last October embarked on a campaign to convince the Germans and the rest of the Europeans that the Continent's salvation from the unprecedented influx of Afghani, Iraqi and Syrian refugees can only be stopped with the help of the Turkish government, which controls the space between these lands and Europe. In November 2015 she struck a deal with Ankara, according to which, in consideration of 3 billion euros, the Turkish state should stop the flow of Middle Eastern emigrants to its EU neighbours--Bulgaria and Greece. There was no concrete action plan, and in fact in the three months that followed the handshake there has been no change in the migration pattern. An official agreement, subject to more tangible obligations by the parties, was due to be signed last Monday in Brussels, at a Summit of the EU Council (EUCO), which was attended by the Turkish Prime Minister Ahmet Davutoglu. But the night before the summit, during a closed-circle dinner that included Merkel and the Dutch Prime Minister Mark Rutte, Davutoglu said that his government was not satisfied with the transaction agreed and it was raising its demands: 6 billion euros in cash, instead of 3, plus expenses, for keeping the refugees in Turkey; visa-free access to the EU for all Turkish citizens as early as June 2016, instead of a previously agreed later conditional date that had still to be decided upon; and acceleration of Turkey's full membership process, regardless of the status of his country's compliance with the Copenhagen Criteria--the Union's rules applicable to all candidate states before acceptance. It should not come as a surprise that on the day of the Summit the 26 other EU member states, who had been left in the dark, were shocked. Smaller states from the East of Europe said they were unlikely to accept any new conditions. Hungary, in particular, said it would veto the decision on any agreement along such lines. Behind closed doors, multilateral and bilateral discussions and corridor diplomacy continued among the Union's heads of government or state until the following morning. In a gesture to 'bridge' the differences and to sweeten the pill, Davutoglu had in the meantime offered to take back to Turkey all refugees who had sailed from its coast and are currently stuck in Greece. In exchange, however, the EU will resettle to its member states one Syrian political refugee for every refugee Turkey will readmit to its territory. This excludes economic refugees, as well as those fleeing Afghanistan and Iraq. This way, Turkey argues and Merkel supports, the 'business model' for the traffickers, who facilitate the migrants' trips to Greece will be broken. Turkey has hosted since 2011, when the civil war in Syria began, 2.7 million refugees. But Europe has been receiving an important number among these. Just in 2015, almost one million emigrants reached the EU and are now dispersed mostly in Germany, but also in the Netherlands, Austria, Sweden, and Greece. The figures advanced by all parties are of little reliability, as border registrations have been erratic and poorly managed. In spite of the 'counter-offer' above and the all-night debate at the EU Council, there has been no consensus on the proposal. The heads of state and government have only agreed that the matter needs further thinking and discussion, and that the situation should be on the agenda of the Ordinary EUCO Summit of 17-18 March. On Wednesday the Western Balkan member states of Croatia and Slovenia, together with their neighbours Macedonia and Serbia, announced that they are closing their borders, thus preventing the refugees from travelling towards Central Europe. These are now trapped in Greece, to the despair of Alexis Tsipras, the PM of Greece--EU's technically bankrupt member. So the final draft of the camel is due for next Tuesday. The designing committee is composed of no less than 32 'experts'. In addition to the 28 member states, those who have a say include Donald Tusk, President of EUCO, Jean-Claude Juncker, President of the European Commission, Martin Schulz, President of the European Parliament, and of course Ahmet Davutoglu. All these are following the rhythm dictated by the baton of conductor Merkel. In reality, however, the director of the show will be Davutoglu--unless, in another histrionic move, Turkish President Recep Tayyip Erdogan decides at the last moment to step in in person. But why call Merkel's migration initiative a camel? Well, because it looks, and it is, very different from an orthodox international agreement to deal with a serious humanitarian crisis, and because the negotiation technique followed by the German chancellor is flawed and prone to disaster for Europe in the longer term. Merkel's vision last November and again this January certainly was to serve to the 28 a flat camel, looking very much like a genuine, bona fide, horse. 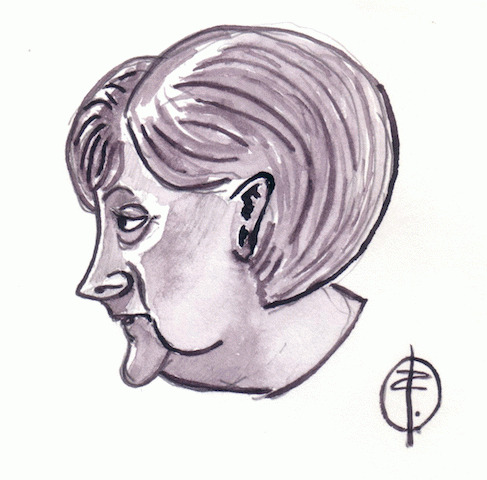 In reality, her main concern was to, initially, show the magnanimity and humanity of the German people, and later, after strong reactions by her constituents against her generosity, to save face and preserve sufficient popularity among her voters. It is unknown for the time being what promises were made to Erdogan and Davutoglu behind scenes in the past five months, outside of what has officially been disclosed. But after last Monday's fiasco, foreign governments, international observers and media, and the average citizen in the German street sense that this camel is not viable. - Financial: It had already been very difficult for many member states to agree to contribute to the initial charge of 3 billion euros. The 'double taxation' to which they are asked to succumb will be extremely problematic to justify to their respective citizens. The economic crisis in Continental Europe persists in spite of periodical optimism, with the exception of Germany and the Netherlands. - Operational: Very few member states have so far agreed to absorb any number of the immigrants above a few dozens a month! The one-to-one deal will require firm commitments by each state to thousands of refugees per month, if the current number of those leaving the Turkish coast for Greece are taken into account. The resettlement process contemplated also means that migrants will have no freedom of choice of their destination, although some of them may have families in particular EU members. Experience so far shows that the vast majority among them want to go to Germany or to Scandinavia, because of the potential for a new life, job availability, and for the social and health benefits that these countries offer. An attractive destination to Syrians is Britain, but the country's PM David Cameron was on Monday adamant that the UK will not be bound by any of the decisions made in respect to this agreement. J N Couvas is an academic, journalist, and an international corporate and political adviser, specialising in Middle East and Balkan affairs. He teaches international strategy and executive leadership at universities in the region. EU Leaders Jockeying for a Place in History!